I started this back in mid-August and have worked on it on and off. It wasn’t quite what I thought would be my next composition but as is the way with these things it wanted to go a certain way and so I went with it. The main folklike melody (A) is hinted at in the intro before a dark waltz (B) takes over. The folk melody is then heard and then it leads to an extended contrasting C section where a hint of the folk tune appears but with the rhythmic pulse suspended for a few bars. The dark waltz returns for an extended expression, with a key-change half-way before the music breaks down into a D section which hints at the folk tune in a deformed state. This leads to a full reprise of the A section with the lower strings playing a counter-melody. I hope you enjoy listening to it – the duration is about 8 minutes. I read today that a year ago Jerry Donahue, the American guitarist famous for his string-bending style, suffered a severe stroke which means he may not play again. So I want to draw attention to a piece of film which captures the genius of his playing. It’s an extract from a 1987 Equinox documentary about the electric guitar. It stunned many guitarists when it was first broadcast and continues to be an inspiration. Here is the youtube link and Jerry starts playing ‘The Claw’ at 8:40 into the track. I think this clip deserves a special place in the recorded history of the guitar because of its influence and impact. Very few guitarists ever do something like that, which sets such a benchmark. One of my all-time favourite symphonies is the Fifth by the Finn Jean Sibelius. I’m certainly not alone in this because the Fifth is one of the most-played of C20th symphonies. I have a number of recordings and have heard it live on many occasions, including in Finland. 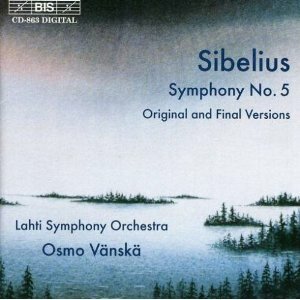 In 1997 the label BIS, who recorded a complete 80-hour edition of Sibelius’ music, released a CD with two versions of the Fifth, one of which had never been heard before: an original version from 1915, pre-dating the final version by four years. During that time Sibelius made many revisions small and large to the music. I had avoided this disc, concerned that hearing an alternate version might spoil how I heard the Fifth. However, a couple of weeks ago I found a secondhand copy. It has been a revelation and a huge pleasure, and I am so grateful to BIS for making it available. I know the Fifth so well that I can appreciate every change Sibelius made. From a composer’s perspective it is fascinating to hear the decisions Sibelius took to make the Fifth the focused masterpiece it is, but some of what he changed or cut out is almost as beautiful. I would compare the experience to finding new paths through an old and familiar forest. If you follow the final path you get familiar rewards. But the 1915 version is like wandering off the usual path and experiencing more of the forest which surrounds the usual path. (It’s on youtube, along with an astonishing quantity of Sibelius’ music). Last Saturday saw the 40th anniversary of the death of the English rock musician / songwriter Marc Bolan. It was marked by two new documentaries, on BBC4 and Sky Arts, and a celebratory gig in West London. I saw and enjoyed the BBC4 film which had some fresh material. For those of my subscribers who are outside the UK, I should mention that Marc Bolan’s group T. Rex were the Top 40 sensation of 1971-72, having a run of hit singles and several successful albums which lasted well into 1973. The hysterical reaction of fans at live T Rex gigs drew comparisons with Beatlemania. During the late 60s Bolan had been part of a mostly acoustic duo Tyrannosaurus Rex playing to a hippie / underground / student audience. The four albums released under that name 1968-70 had Bolan writing poetic lyrics which seemed like postcards from a Tolkeinish world of his own invention – pastoral, innocent and enchanted. As he gradually introduced electric guitar these lyrical preoccupations faded, but there was enough of that enchantment hanging over to make the early T. Rex quartet’s music a special blend of magic and rock’n’roll such as has never been heard in the Top 40 before or since. Who else but Marc would put in ‘Get It On’ a line like ‘You’re an untamed youth … (name-checking an Eddie Cochran film) … with your cloak full of eagles’, not to mention the ‘hubcap diamond star halo’ and the ‘teeth of the Hydra’. Along the way he almost single-handedly invented glam rock, dressing up on Top of the Pops a year before Bowie put his arm round Mick Ronson for ‘Starman’. Sadly, the decline, musical and personal, was precipitous from 1974 on. But the inspiration from that earlier music has lasted a lifetime for me. T. Rex were the first rock band I saw live, and made me want to take up playing guitar and writing songs. Bolan’s example is for songwriters an encouragement, in terms of how much you can do with little material if the creative energy is high, and how you can get stuck if you don’t care enough about the parameters of your music. He also had a wonderful palette of electric guitar tones which are tricky to emulate. But in recent years a few of them have come alive under my fingers, and that has been a thrill. It is a truism that there are always new things to find on an instrument. I was reminded of this transcribing a song by Elvis Costello for a guitar student. The song featured a rising bass line where an inverted chord was succeeded by a root chord. Such bass-lines are common in more sophisticated songwriting, enjoyed by songwriters and listeners alike for the feeling of mobile ingenuity they convey. I found myself looking on the guitar for a playable G# chord with B# as the bass note. G# major is usually fretted (466544) with a standard barre chord. Initially, I couldn’t find one where B# would be the lowest note – and then saw a solution by using enharmonic equivalence. It’s a simple concept. Western music has 12 notes, five of which have two names each. They are enharmonically equivalent. These are the sharp / flat notes (A#/Bb, C#/Db, D#/Eb, F#/Gb. G#/Ab), the black keys on a piano. Which name is used depends on musical context, and sometimes this has significant musical consequences. I found the shape I needed by thinking of G#/B# as its enharmonic equivalent Ab/C. Straightaway this shape – x3111x – presented itself and fitted nicely into the sequence. Problem solved. begins ambiguously hovering between tonalities of D and C. At 2:15 the music darkens into an overcast C minor before achieving a startling and joyous shift into E major at 3:22, as though the sun had broken out. The keys of C minor and E major are distant from each other – three flats versus four sharps – so it would seems that moving from one to another might be a big step. To establish the key of E major the note D# is important. But how can it appear in C minor? The answer is the note is already there, disguised as the enharmonic, Eb. By treating the one note differently the key change is facilitated. I’ve been following recent coverage of the 50th anniversary of the Summer of Love in general and Sgt Pepper’s Lonely Hearts Club Band in particular. 1967 seems an awful long time ago now, not only chronologically but culturally. There is something archetypally magnetic about the Summer of Love, even when one rationally considers that if its idealism had been all that it has been made out to be it would not have foundered quite as soon as it did. The BBC screened a good documentary last week with Howard Goodall providing the analysis – it was commendable in its focus on musical details of song composition or recording technique. I’ve enjoyed listening to the early takes featured as a companion disc to the CD of new stereo mixes. It is fascinating to listen in on the work-in-progress and marvel at what the Beatles were doing within the confines of 4-track recording. People who go for the full box-set which has much more of that stuff will be in for a treat. The instrumental version of ‘Penny Lane’ shows the much-discussed influence of Pet Sounds on the Beatles, to the extent that at the earlier stages it could almost be a backing track for a Beach boys song. Those on-the-beat piano chords are typical of the way Brian Wilson had been writing songs. Had I time I would be tempted to write and record a Pet Sounds-style vocal and lyric over that backing track to see what that would be like. It is great that almost all of the Beatles time in the recording studio has been preserved. Sadly this is not the case for many groups and hits of the 60s and 70s. Even major bands like The Who have lost multi-track recordings. I was once told an amusing if horrifying story about what happened to one multitrack of a very successful 70s rock band. The tape was stored on top of a Marshall 4×12 cabinet. When it was retrieved for a new mix the tape was discovered to be blank – the magnets in the speakers had wiped everything! Sgt Pepper is an album I’ve always admired though it hasn’t been a particular favourite. But my recent listening to it and reflecting on the album’s spirit of adventure has made me like it rather more. It is worth mentioning in connection with its status as a work of musical art that it is the only rock album covered in Cambridge University Press’s excellent handbook series, among about two dozen classical milestones. I’ve recently read a number of novels where classical music is a strong concern. Aside from their inherent interest, I am planning a course for the summer of 2018 that will cover a few of these novels and branch out to explore the music they mention. Some years ago I read Ian McEwan’s Amsterdam (a satire featuring rival composers) and Vikram Seth’s An Equal Music (features a string quartet). In the past few months I’ve read two novels about Shostakovich: Julian Barnes’ The Noise of Time and Sarah Quigley’s The Conductor (about the Seventh symphony and the siege of Leningrad). I’ve also read Natasha Solomons’ The Song Collector (which touches on folk song collecting and mid-C20th English music), Steven Galloway’s The Cellist of Sarajevo, and Richard Powers’ Orfeo. The Barnes novel I recommend because the writing is concise and thoughtful, and effectively terrifying in places in evoking the horrible stresses of life in a totalitarian regime, though it relies so much on biography I’m not sure it qualifies as a novel at all. I think it was Barnes who wrote an interesting short story ‘Silence’ about Sibelius and the mystery of the Eighth symphony. Powers’ Orfeo is, for all its faults, a must-read for anyone interested in music as a life-changing phenomenon which goes far beyond just entertainment. This novel is saturated with musical reference at every turn, whether at the small level of metaphor and simile, epigraphs and quotations, to substantial digressions on several famous pieces, such as Messiaen’s Quartet for the End of Time. Recent music I’ve enjoyed includes French songs from the late 1960s by Serge Gainsbourg, Arvo Part’s Tabula Rasa, John Adams’ The Dharma at Big Sur, and Lutoslawski’s Concerto for Orchestra. In recent years UK media have been celebrating so-called ‘Scandi-noir’ crime shows and fiction. As usual, this focus on Nordic countries hasn’t generally extended as far as music. I’ve been listening again recently to Einojuhani Rautavaara, the Finnish composer who died at the age of 87 at the end of July. According to Guy Rickards’ Guardian obituary he wrote eight symphonies, nine operas, 12 instrumental (and one choral) concertos, plus a wide variety of orchestral, chamber, instrumental, choral and vocal works. He had an interesting development as a composer, gradually re-embracing tonal music in a neo-romantic style which by the end of the C20th made him Finland’s most well-known composer since Sibelius. There was a mystical side to his music and outlook, and references to angels occur in a number of his pieces (and this long before angels were made fashionable by New Age spirituality). Like many, I discovered him through accidentally catching his Cantus Arcticus (Concerto for Birds and Orchestra) on the radio. This haunting 20 minute three-movement piece features the orchestra playing melancholic and reflective music over a tape of birds recorded at the Arctic Circle. You can find it on a Naxos budget CD along with his Piano Concerto and Third Symphony. The symphony has long been a favourite of mine, sounding like a compressed Bruckner with strong Sibelian overtones. Initially I couldn’t make much of the Piano Concerto, but I’ve revisited it recently and now greatly enjoy it, and I can also recommend the first movement of his Symphony 1. Discovering Rautavaara came at a significant moment for me, because it was a reassurance that my intended journey into C20th classical music would turn up many gems. And so it has proved over the past 18 years.